A winning website is much more than fancy design, cool graphics, and interactive features, though those are always a bonus. A winning website meets business objectives and achieves marketing goals. In order to build a website that does both, you need to start with the basics. First and foremost, you need to identify your main objective. While the objective may seem obvious – get more traffic and make more sales – the nature of your business will dictate the goals for your site. For instance, if you own a law firm, you might be more concerned with generating leads by highlighting your accomplishments and educating your visitors. On the other hand, if you’re a photographer, your site might focus on showcasing your work in an appealing way to sell it online. Once you’ve figured out the main goal for your website it’s time to get started. Main Goal: Increase brand awareness. Corresponding Objectives: Social media engagement, online promotions, and reputation management. Corresponding Objectives: Search engine optimization, well-written content, clear calls to action, user-friendly site, and increase conversion rate. Main Goal: Become an authoritative resource. Corresponding Objectives: Produce well-researched and high-quality content on your website, regularly add new content in the form of a blog post, establish trust, and market your expertise via websites and social media. Developing an ideal visitor persona is paramount to the success of your website. If you do everything right in terms of design, content, and development but your site does not appeal to your target market, you’re not going to get results. Everything from design to layout to content needs to appeal to your ideal demographic. For instance, let’s say that you sell camping gear. Busy animations, fancy slideshows, and blocks of text are not likely to work to meet your main objective (increase sales). Your target audience will be more interested in clean, crisp images and bulleted lists that identify each product’s features, along with brief descriptions that inform the shopper of what each product is used for, when it should be used, and how it should be used. Each product page should have an “Add to Cart” button to allow for easier shopping. On the other hand, if you offer legal services, you might include landing pages that inform the visitor of the types of legal services you provide, a comprehensive bio, and, if applicable, a page detailing the types of cases that you have taken on and won. You might also include a bold “Contact Us for a Free Consultation” button at the top and bottom of each page. Project Summary: Your project summary should encapsulate the general overview of your business, including your business objectives, the products/services you intend to include on the website, your industry’s environment, and your ideal customer persona. You should also identify the unique value that your products or services provide to your target audience. Project Goals: Whereas in the project summary you stated your overall business objectives, in this section you should list the specific goals you hope to achieve with your website. Website goals may be (and usually are) very different from overall business goals. Detailed Description of Target Audience: Again, thoroughly understanding whom your ideal visitor is is key to your website’s success. Use this section to describe, in detail, whom you intend to attract and what you hope for them to do. Your audience profile section should include demographics, brand perceptions, audience needs, and buying behaviors. The Overall Message: Though your brand should have one consistent message across all channels, you need to figure out how best to convey that message over an online platform so as to motivate your target audience to engage with your organization through your website. Identify the Competition: Finally, the ability to identify and understand your competition will go a long ways towards helping you create a winning website. Check out the competitions’ websites and pay special attention to their messaging, branding, navigation, and calls to action. In this stage, you will start to brainstorm all the key pages your site needs. This can include a Home page, About Us page, Contact page, Products/Services page, and Blog, just to name a few. Identifying the pages you need is the easy part; the hard part comes when you must (because you must) figure out how all of your pages will interact with one another. This will dictate how your site’s overall navigation will be structured. Having a clean sitemap that makes sense is not only helpful for your website visitors, but also, it boosts your search engine rankings. Search engines do not like having to crawl dozens of pages, trying to figure out how each fits with the next. If you can make it simple for them, you will be rewarded. Once you have your sitemap in place, it’s time to decide what type of content you want on each page. This is where most of your information gathered in steps 1, 2, and 3 will come in handy. While content certainly includes written content, it also encompasses everything from video to images, and from the site’s background to popup elements. At this stage it is helpful to have a pencil and paper handy on which you can sketch and play with different content layouts. Keep in mind though that your site is not stagnant, and if a certain content hierarchy does not work on any given page, or if content proves to be useless, you can always add, change, and remove it. It’s coding time. Once you have a wireframe developed and a basic design in mind, slice the final mockup and write the HTML and CSS code for it. Any interactive elements that you want to add can come later; for now, it’s time to just get a rough idea of what the framework of your site is going to look like so you can start developing and truly bring it to life. With your framework firmly developed and your code fleshed out, it’s time to start visualizing what your site is going to look like. 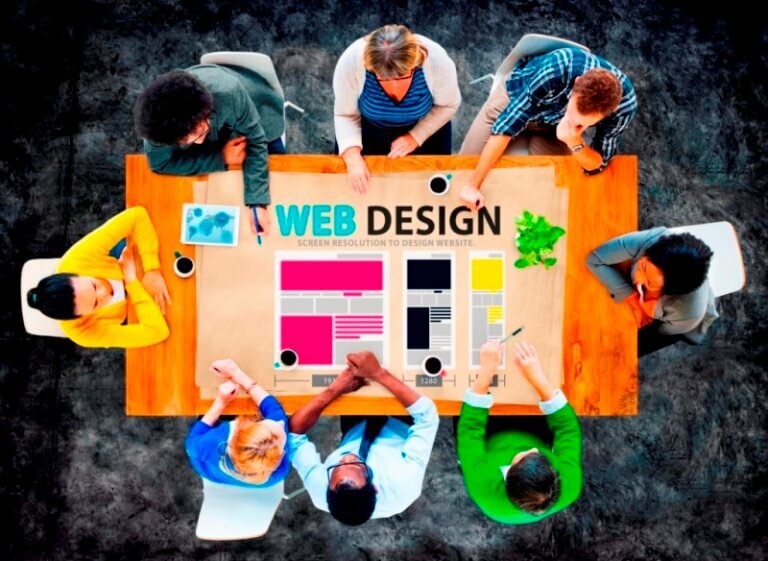 The visual elements of your website should, ideally, be in line with your organization’s brand, as your website is just an extension of all your other forms of communication. If working with designers out-of-house, make sure they have a firm understanding of your company’s vision, what you sell, your goals for your website, and the brand. More importantly, make sure that they know how to convey key brand concepts through design. Content is King. This phrase was true 50 years ago when door-to-door marketing was the norm, and it’s still true today in the digital age. In fact, it is truer today than ever before. With the huge amounts of content available literally at our fingertips, people use the World Wide Web to ask questions and provide answers. While it is truly amazing that we have the capability to do this, it has lead to a surge of low quality, ill-advised content. Which is great for businesses that want to do content right. Consumers are smart. They recognize BS content when they see it and place their loyalty only with those that take the time to address their questions and concerns in a well-researched and well-thought-out way. They do not have time for fluff. That is why it is so important to invest in quality content, the kind of content that provides answers and clarity. The benefits of investing in quality content are numerous, but one of the most significant benefits is the fact that it will continue to work for you long after its creation. If you address a pressing consumer concern in a smart and engaging way, people will continue to turn to you for answers. The more clicks a single piece of content receives, the higher it will rank in search engine results. It doesn’t matter if your article is one, five, or 10 years old—if people continue to read it, it will continue to boost your rankings. Moreover, that single piece of content will push your other content to the top of the search engines. This is because the search engines will begin to recognize you as a thought leader, and a far cry above the masses of publishers that produce and push out lackluster content on a daily – nay, hourly – basis. Product and Service Pages: To help set you apart from competitors with the same or similar offerings, create descriptive and unique products and services pages that are optimized with popular search terms and effective calls-to-actions. Blog Posts: The search engines love fresh content, so oblige them and produce blog posts that address customer concerns, answer their questions, and provide real value. Video: Content doesn’t just have to be text. Video is a great way to reach people across various platforms, as it’s shareable and easy to consume. Free Guides, EBooks, and White Papers: Long-form content is one of the best ways to establish a name for yourself within your industry, generate leads, and produce results for months or years to come. Infographics and Other Visuals: Infographics and other visuals, such as charts, datagraphics, and gifographics, are a great way to educate consumers who are more visually oriented. Content is a great way to turn an otherwise functional page into a medium for establishing lifelong relationships with your readers and to become their trusted solution provider. Capitalize further on your content by implementing an informed content marketing strategy that takes your ideal customer’s needs, concerns, and online habits into consideration. Content is not just there to provide “filler” to your pretty website—it is the essence of your website. When you produce content that is relevant to your readers and become a valuable and trusted industry expert, the search engines gods will smile upon you. Now it’s time to put it all together. Once your design has been approved, the framework established, the code created, and the content fleshed out, it’s time to start building. Take the tips mentioned in the section above regarding content and start producing videos, website pages, blog posts, and visuals. Remember, Content is King, so treat it as such! While you’re waiting on your content, start to build out the HTML and CSS of the site. While you can use website templates, developing a site from scratch allows you to incorporate unique elements and really capture the essence of your business. Once the content is ready and the HTML and CSS complete, load up the content. This step is tedious but necessary; once it’s done, give yourself a pat on the back—you’re almost there! New websites almost always come with a few hiccups, so it’s important that you do a full review of the site prior to publishing it live, verify links, and test functionality. This is another tedious but essential step in the website development process, as broken links, typos, or missing information are bad for rankings and customer retention. While still in the test phase, review the sites on multiple browsers, such as Firefox, Safari, Internet Explorer, and Chrome. Also review it on multiple devices, including laptops, desktops, and mobile devices. If any breaks occur, this is the stage in which you can fix it. After giving your website a final run through, polishing design elements, and deeply testing your site’s interactivity and features, move your site to its permanent webserver. You will, again, need to test your site on its server, as different servers come with different features and can behave in unexpected ways to a particular line of code. If you’re not in a huge hurry to meet a deadline, take a little extra time to fine tune the design of your site. You’ll be surprised by how many small tweaks you’ll end up making in this final stage, as now that you have time to take a breather, you’ll notice small areas for improvement. Test the website one final time once it’s on the live server. Use all the tools at your disposal, such as code validators, broken-link checkers, spell-check, website health checks, and others like those. It will benefit you to find any mistakes as soon after going live as possible. Check the website in multiple browsers one last time just to receive further validation that all is as it should be. Many people tend to launch their site then forget about it. Don’t do this! Your website will never truly be complete as it will require maintenance, content upgrades, seasonal changes, design changes, fixes, and so much more. Websites are living, breathing entities and should be given the due care than any other living, breathing force would receive. Website development is an ever-changing process, and what proves to be successful is different for everyone. However this blueprint serves as a great starting point for those who wish to tackle website development on their own. If you’re interested in working with a team of experienced website developers, designers, and copywriters, reach out to The Mammoth Group to see how we can help you build the winning website you’ve been dreaming about.